8 digit LCD display with extra large 14mm digits. 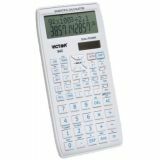 Features basic calculator functions as well as a change sign key, square root key, percent key and 3-key memory. 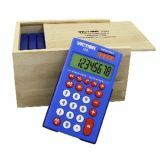 Kit includes 10 calculators in an eco friendly wood caddy. Protective cover included. Operates on hybrid power (solar battery backup). 2 year manufacturer warranty. 4 3⁄4"H x 2 3⁄4"W x 1⁄2"D. Set of 10. 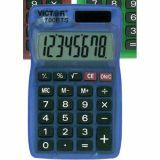 Features an 8 digit display, full memory functions and a slanted display for easier viewing. Dual powered. 8 digit LCD display with large 9mm digits. 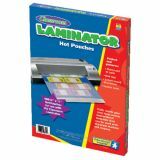 Features silver housing, non-slip rubber keys and a soft grip surround. 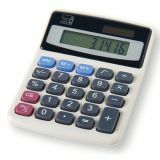 Other functions include: 3 key independent memory, square root, change sign and percent keys. Protective snap-on cover included. Operates on hybrid power (solar/battery backup). 2 year manufacturer's standard warranty. 4 1⁄2"H x 2 5⁄8"W x 1⁄4"D. Assorted colors. 10 digit LCD display with large 10mm digits. Features 20 built-in metric conversion functions including: length, area, capacity, weight, volume, energy and temperature conversions. Other functions include: backspace, change sign, percent, square root keys and 3 key independent memory. Operates on hybrid power (solar/battery backup). 2 year manufacturer's standard warranty. 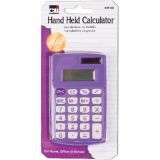 5-1⁄2"H x 2-3⁄4"W x 1⁄4"D.
Holds up to 35 student calculators in 3.75" x 4" clear numbered pockets. Tough nylon chart has reinforced grommets for hanging. Calculators sold separately. Also great for storing cell phones! 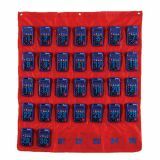 Measures 29"W x 36"H.
Perfect for independent math practice, Primary Calculator. 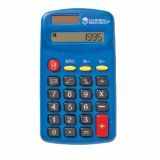 Bright blue calculator is both solar and battery powered. Students can start with basic math operations and work their way up to percents and square roots. 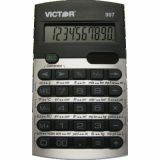 The 4-function calculator includes a 3-key memory, auto shut-off, and an 8-digit display. Buy the set and save! 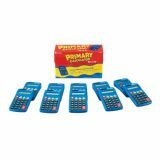 Your early learner can start learning basic calculator skills with this Primary Calculator. They can start with basic math operations and work their way up to more advanced concepts such as percents and square roots. This dual-powered, four-function calculator includes auto shut-off, 3-key memory and more. Calculator Measures 4.5" x 2.5"
Requires 1 AA battery, included. 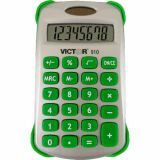 10 digit advanced scientific calculator is perfect for students in General Math, Algebra 1 & 2, Science, Statistics, Trigonometry, and Geometry. 2-line display shows entries on the top line and results on the bottom. Other functions include: quadratic and cubic equations, coordinate conversion, trigonometric functions in degrees and radians, fractions, reciprocals, factorials, basic scientific functions, and more. Operates on hybrid power (solar/battery backup). Includes a clear protective hard shell case. 2 year manufacturer's standard warranty. 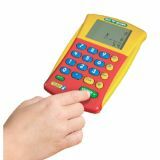 This brightly-colored calculator with its over-sized LCD screen is the perfect child-friendly tool for reinforcing basic math skills. The simple four-function calculator sets up the problem exactly as young students are taught to write it out. As they carry out addition, subtraction, multiplication and division problems, the display window shows the entire problem, not just the last number entered. A great way to introduce elementary school children to using calculators for more difficult problem-solving. Requires 2 AA batteries (not included). Includes 12 calculators. Child-friendly calculator displays equations in the same format students write them.